Shuck and Jive: Jeesixohoneohsixbee Outta here! Our Peacemaking Committee helped us celebrate More Light Sunday by dedicating their table to More Light Presbyterians' "Write Now" campaign. They put out a mailbox for cards to be sent to commissioners of the upcoming General Assembly urging the removal of discriminatory policies, particularly G-6.0106b. The time is Right Now to remove barriers to ordination for lesbian, gay, bisexual, and transgender Presbyterians. Please support the removal of G-6.0106b and other barriers to equality. We all need to welcome all people. Everyone is a child of God. We should not question God! Would Christ think the church should have two classes of membership? Are some of us more equal than others? Peace. Justice. Love. For all. As we all struggle to follow Christʼs teachings, I need my church to do so, now. Many lives depend on this! My son is gay. God made him that way and God couldnʼt have made a finer person. Please donʼt deprive yourself of the gifts and service of lesbian, gay, bisexual and transgender people. The church should be the leader in ending discrimination not the leader in perpetuating it! The Lord created all people. Let them be. I am straight but this is long overdue! Thank you in advance for your attention and action on this important issue. Please take a stand AGAINST injustice, bigotry, oppression and hate! None are free if some are oppressed. Get on with the program and stop this homophobic nonsense! Please remove the barriers so that the whole church can communicate Godʼs welcome to all people. No more second-class citizens. Here is my More Light Sunday sermon. Also, if you can knit fast, we need 500 more scarves for this GA! Michael has the details! 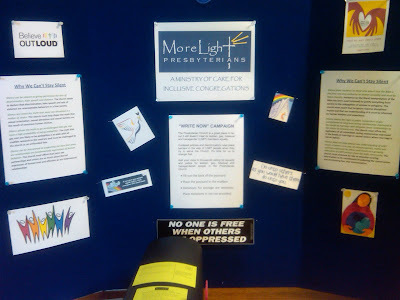 Check out the More Light blog to keep track of the overtures. 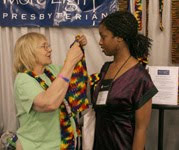 Here is a nice article about the scarves from the Presbyterian News Service. Is Evangelism a Selfish Idea? Pick-O-Matic Gives Dulcimer Players a Third Hand! 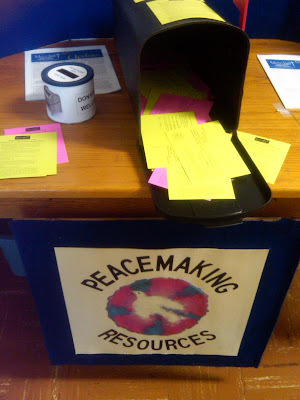 If PCUSA is a circus, what is the LayMAN?